What can you do with SQL to Excel? You can export tables of MS SQL Server databases into CSV-formatted files, and open these files with Excel. What software license is it under? Only through the forum. Please DO NOT email us for SQL to Excel support. Support emails will be unanswered. It is a free product after all. Does it have a Command-Line Interface? Connect to your SQL Server database by clicking the Connect to SQL Server button. You can use Window or SQL Server Authentication. Don't forget to test your connection by clicking the Test SQL Connection button. In the right pane, you will see a list of databases found on the target SQL Server. Select the database to export. After you select a database, you will see a list of tables from that database with checkboxes. Select a subset of tables to export or all of them (using the All link above the list). Now you need to specify a folder in which to put the exported files. Enter the folder path in the Output folder field, or just browse to it using the button on the right. Note that the folder should already exist. Click the Generate CSV button. 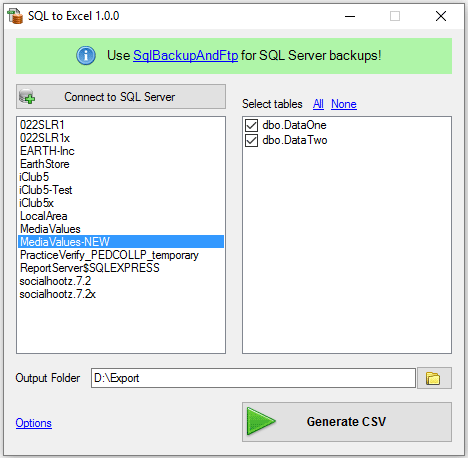 One CSV file per SQL table will be created in the chosen folder. Optionally, you can fine-tune the export process by specifying the maximum CSV file size (10 MB by default). Specifying this value will split the output CSV files record-wise. In addition, you can specify whether to insert column names as the first line in the output file, and whether to open the output folder when export is finished.